The President of the Republic of Costa Rica, H.E. Mrs. Laura Chinchilla Miranda, today launched a Resource Guide on Nuclear Disarmament for Religious Leaders and Communities at a high level consultation held in the United Nations in New York. The Resource Guide (click here for a preview copy) was developed by Alyn Ware and the Basel Peace Office for Religions for Peace, a global coalition of representatives of the world's major religions. A Public Interest Report from the Federation of American Scientists, by Robert Alvarez, fall 2013. 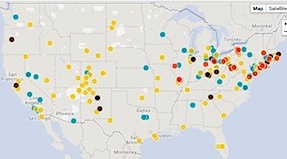 The Wall St. Journal has compiled a searchable database of contaminated sites across the US. 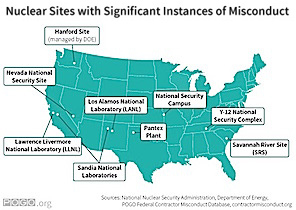 "A Nuclear Cleanup Effort Leaves Questions Lingering at Scores of Old Sites; Years Later, the Legacy of the U.S. Arms Buildup Remains Near Homes, Parks and Malls"
Is your organization not listed here? Do you have a suggestion for another link? Please email webmaster@nukewatch.org to give your suggestions or requests. The global treaty on the prohibition of nuclear weapons is now open for signing. As of Sept 25, 53 countries have signed, so the treaty enters into force for those signees. 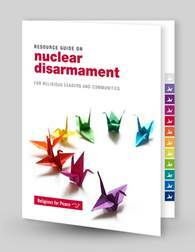 To educate and advocate for peace and a world free of nuclear weapons, and to empower peace leaders. Videos, publications, programs. 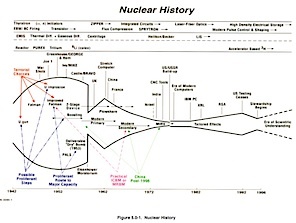 NuclearFiles.org: a project of Nuclear Age Peace Foundation, offering extensive material for educators, including, for example, detailed nuclear timelines for each of the years from the 30's through today. Mission: "ICAN is a global campaign coalition working to mobilize people in all countries to inspire, persuade and pressure their governments to initiate and support negotiations for a treaty banning nuclear weapons. The campaign was launched in 2007, with more than 300 partner organizations is now active in more than 80 countries worldwide." About GZ: "We've spent years building a nonpartisan, international community of influential political, military, business, civic and faith leaders- matched by a powerful global grassroots movement. We're not tilting at windmills. We've got a plan. And it's backed by experts and leading newspapers worldwide. The challenge now is getting world leaders to act on it- and only unified, international public pressure can create the necessary political will to make it happen." Very active on nuclear abolition. A project of the Women's International League for Peace and Freedom. NSP is the earnest effort of George Schultz, William Perry, Henry Kissinger, Sam Nunn. "Reassertion of the vision of a world free of nuclear weapons and the practical measures toward achieving that goal would be, and would be perceived to be, a bold initiative consistent with America's moral heritage... The effort could have a profoundly positive impact on the security of future generations." Nuclear Watch's amicus brief is posted here (PDF). The U.S. motion to dismiss and the other amicus briefs are available here. Abolition 2000 is an international global network of over 2000 organizations in more than 90 countries working for a treaty to eliminate nuclear weapons within a time-bound framework. Reaching Critical Will is the disarmament program of the Women's International League for Peace and Freedom (WILPF), the oldest women's peace organization in the world. They published "Unspeakable Suffering: The Humanitarian Impact Of Nuclear Weapons". Extensive resources are available at the website, including country profiles, treaties, and fact sheets. "The Holy See shares the thoughts and sentiments of most men and women of good will who aspire to the total elimination of nuclear weapons." 50 Years After Pacem in Terris, The Holy See Insists on Nuclear Disarmament"
ANA is an alliance of 30+ local watchdogs and national organizations (Nuclear Watch is a member), 'working to empower citizens to take action and to protest an opaque and mismanaged nuclear complex'. 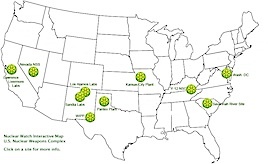 From ANA's 'about us' statement: "Through our collective action, we have shut down nuclear weapons sites that were contaminating local communities, established funds for monitoring and technical assessment, and ensured that federal facilities are subject to state environmental enforcement. We have blocked dangerous nuclear weapons programs, supported more responsible management plans, and worked to decommission hazardous nuclear reactors. We know how to win against an often intransigent government and contractors that waste billions of taxpayer dollars through mismanagement and, sometimes, sheer incompetence." Resources: by countries, by subject, reports, threat assessments, fact sheets, issue briefs. 'The Federation of American Scientists is one of the longest serving non-governmental organizations devoted to reducing nuclear dangers and other threats to national and international security by providing rigorous, nonpartisan, technical analysis and recommendations to policymakers and the public. FAS works on a variety of issues including nuclear weapons, radiological and nuclear terrorism... non-proliferation and counter-proliferation.' Of particular interest: F.A.S. Strategic Security Blog. See also issue briefs, reports, publications. Home of the Doomsday Clock and a deep online resource. The Bulletin has been published continuously since 1945, when it was founded by former Manhattan Project physicists after the atomic bombings of Hiroshima and Nagasaki. The Bulletin's primary aim is to inform the public about nuclear policy debates while advocating for the international control of nuclear weapons. The Union of Concerned Scientists' site covering nuclear weapons and nuclear power. Of note: the "Nuclear Energy Activist Toolkit"
Ploughshares is a major voice in nuclear arms reduction and non-proliferation efforts. Mission: "CNS strives to combat the spread of weapons of mass destruction by training the next generation of nonproliferation specialists and disseminating timely information and analysis. CNS at the Monterey Institute of International Studies is the largest nongovernmental organization in the United States devoted exclusively to research and training on nonproliferation issues." Workshops and trainings, Educational Resources, Conference Series. 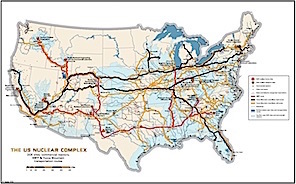 IEER provides activists, policy-makers, journalists, and the public with understandable and accurate scientific and technical information on energy and environmental issues arising from nuclear power, nuclear weapons, and nuclear waste.